A brush beating stick is one of the essential tools to putting out bunnies from their cover for the hawk to see. If you have ever used flimsy pine lumber, or even a bamboo stick, you know that it doesn’t take long for your stick to wear out, splinter apart, or even break in two on the second ‘whack’. Here is a do-it-yourself way to ensure many days of repeated brush beating without decreasing the life of your stick. 1. If the broom handle is too pointy, then you may wish to saw off a small section to ensure a flat fit on the Rubber foot. Drill a 1 inch hole in the bottom of the stick. 2. Mount the rubber foot on the bottom of the stick. Put the washer on the screw, and screw the rubber foot to the bottom of the stick. The washer will help provide a way to keep it on the stick so it doesnt come off from the bottom. 3. 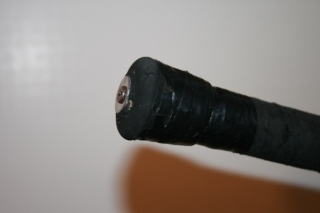 Use some hockey stick tape and start wrapping the bottom of the stick at the rubber foot. This will keep the rubber from moving up the stick, should it tear away at the washer. This also has an added benefit of preventing splinters when hitting large logs and trunks. 4. At the top of the stick, measure a point where your hand comfortably rests, and wrap several turns of friction tape around this point. 5. 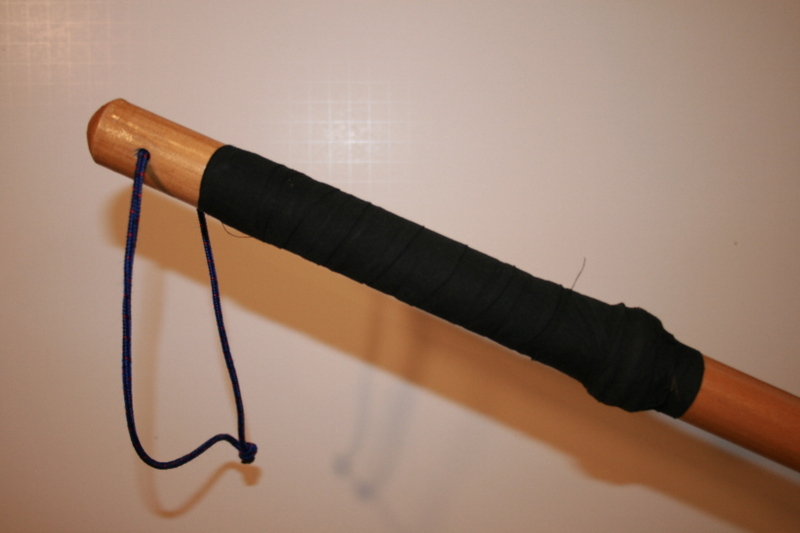 Wrap the top section of the stick with hockey tape, so that it provides a good place for your hand to carry the stick. 6. Drill a hole perpendicular in the top of the stick. Thread some parachute cord through and tie a knot. Make the loop in the cord large enough to slip your hand through.